When detail and surface finish are the main concerns, look no further than Concept Laser’s Mlab cusing systems. 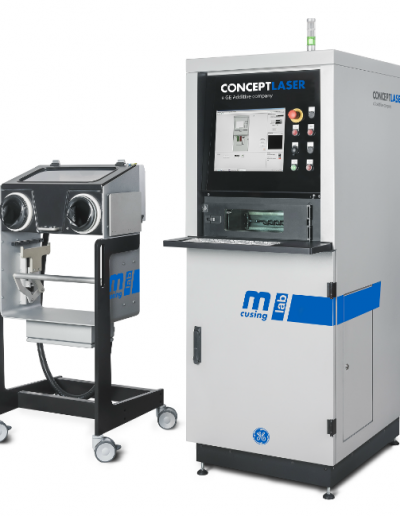 These machines offer a smaller laser focus and thinner powder layers to build some of the most detailed and highly-resolved parts possible, all in a machine with a small footprint. Known for their fast printing speed and strong, quality parts, the Mlab printers are popular in the medical, dental, and manufacturing industries. The Mlab cusing machine is capable of producing detailed parts from non-reactive materials, while the Mlab R version can also print with reactive materials such as titanium and aluminum. The technology is capable of producing both prototypes and batch parts, including mould inserts with close-contour cooling as well as direct components. Mlab printers can print with an extensive range of materials, including gold, bronze, silver alloys, cobalt-chromium alloys, and stainless steel. With their compact size, the printers are well-suited to labs and production floors with limited space; they also require less ancillary equipment than larger industrial printing systems. The ideal machine for manufacturing components with elaborate structures. Perfect when what matters is high surface quality and the finest component structures! The Mlab cusing is the ideal machines for manufacturing parts with delicate structures. It is perfect when additionally high surface quality is what really matters. The special thing about the machine is its very user-friendly, pull-out drawer system that is very safe at the same time. This includes both the build chamber with a dose chamber and the storage container. In addition, it allows a rapid change of material without the risk of any contamination of powder materials. The patented drawer system is available with three different build envelope versions. The ideal machine for manufacturing metal components with elaborate structures, and parts made from reactive materials like titanium. Ideally suited to fine detail, high-quality surface finish, and precision component structures. The Mlab cusing R is the deal machines for manufacturing parts with delicate structures. It is perfect when additionally high surface quality is what really matters. The special thing about the machine is its very user-friendly, pull-out drawer system that is very safe at the same time. This includes both the build chamber with a dose chamber and the storage container. In addition, it allows a rapid change of material without the risk of any contamination of powder materials. The patented drawer system is available with three different build envelope versions. The Mlab cusing R now also expands the previous range of materials to include titanium and titanium alloys. It also boasts the patented “drawer principle” and handling station for the safe and secure handling of reactive materials. The robustly constructed machines are space-saving and will fit through the door of any room. The Mlab cusing 200R is the perfect machine for high surface quality and the finest part structures. In contrast to the Mlab cusing R it makes it possible to manufacture even larger parts with much greater productivity, without the machine losing any of its familiar compactness. The Mlab cusing 200R boasts a new user-oriented design, with a larger build envelope (54% more build volume), a higher laser power of 200 watts and a space-efficient footprint. In addition, the new machine includes a larger filter, resulting in longer filter lifespans, and a clamping system which enables more accurate component positioning. Special features are the water-floodable filter and the modular structure of the machine. The process chamber and handling station are physically separate and enable safe and easy component handling. All process steps take place under inert gas, shielded from external influences. The whole process can, therefore, be implemented reliably and with the maximum quality level. For the Mlab cusing 200R, we also offer an inertized sieving station QM Powder S as a stand-alone unit. The user can apply a variable number of sieves (1 – 3 units). A three-dimensional sieving motion enables optimum utilization of the sieve surface area.